In this article I would like to introduce you to the Explorer (Old Site-Structure) Add-in of Squadron. What are the advantages of Explorer? 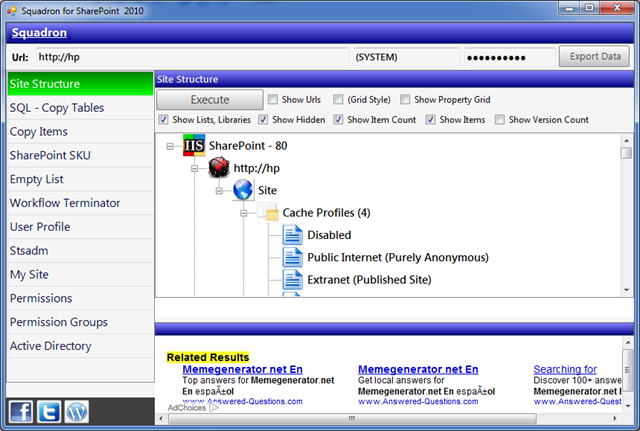 Using Explorer we can quickly generate the Site Collection, Sub sites, Lists & Libraries, Items in hierarchical manner. The information is useful in analyzing a site collection. We can also view in Grid Style where the above objects are displayed in Rows with facility to export too. 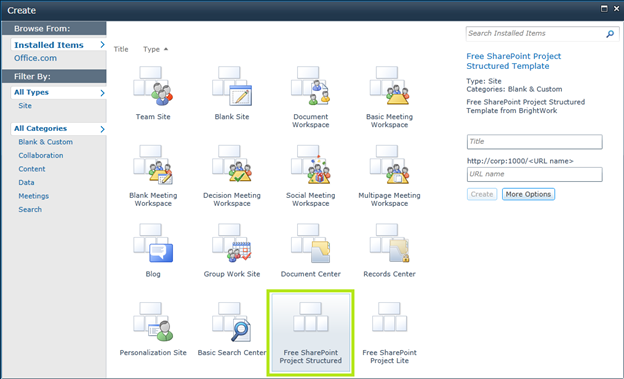 Squadron is a Free SharePoint 2010 Productivity tool deployed using ClickOnce technology. You can install it from following location. How to generate the Structure? 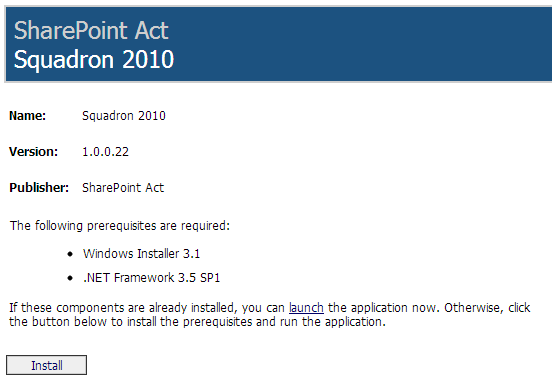 Install the Squadron application & execute it using the Desktop short cut. You will get the following screen. 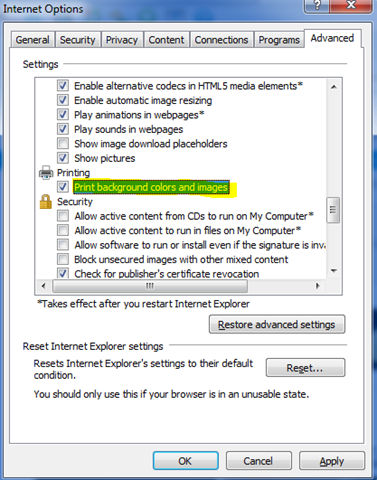 Now click on the left pane named Explorer. 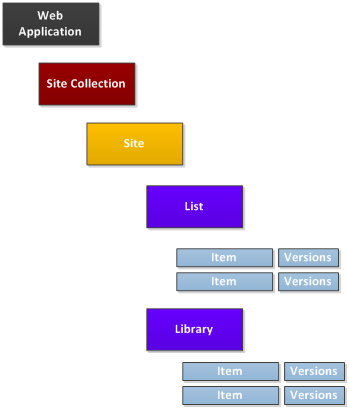 You will get the following Site Structure screen. Please note that you can include Lists & Libraries by checking the Show Lists, Libraries checkbox. Additionally you can include Items & Versions using the Show Items, Show Version Count Checkboxes. Following is the result after generating Items & Versions. Please note that the versions are displayed within Parenthesis. We can also generate Grid Style using the Grid Style checkbox. Now click the Execute button again. After saving, the file gets opened inside Microsoft Excel. 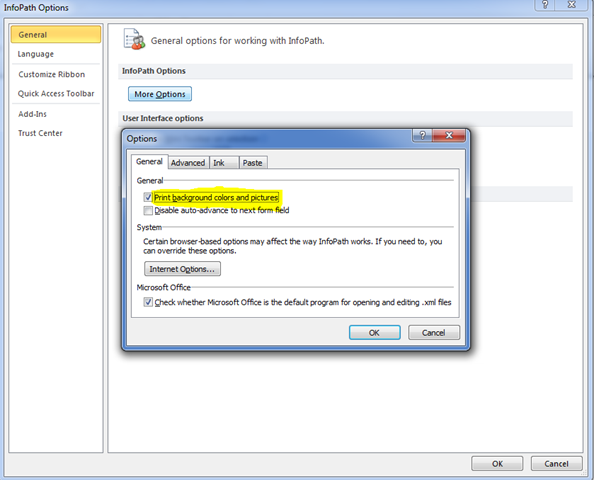 You may uncheck the Open after save option if you do not prefer automatic launching of file after saving. CSV option is also good but if you have COMMA (,) character in the names of Site, List, Items the generated file will be confusing. The hidden lists checkbox allows you to include Hidden Lists in the result. Hidden Lists are those not displayed in the Quick Launch bar as well as the System Lists. You can view these properties by clicking the result item; the Properties will get displayed in the right side. Following is the code to generate the Hierarchy information. In this article we have explored the Site Structure Add-in in Squadron. I believe this would be a helpful tool in your bag while visiting a new SharePoint customer. You can download & use Squadron for Free, if you face any installation problems, please let me know. In this post we can explore an Architect Track topic. 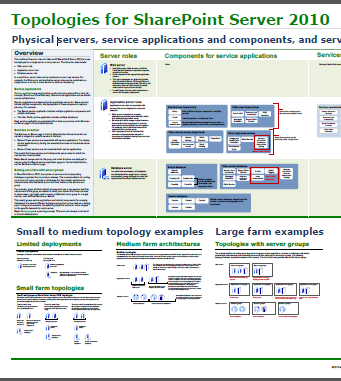 SharePoint Topology determines the number of servers in a SharePoint farm. In the matter of Topology determination we can use the following PDF from Microsoft. Today i encountered a problem said by my customer. He was not able to print the InfoPath form with background color. There are multiple areas for us to make it enabled. I am listing all the potential areas you might need. There is one more are you need to enable it. 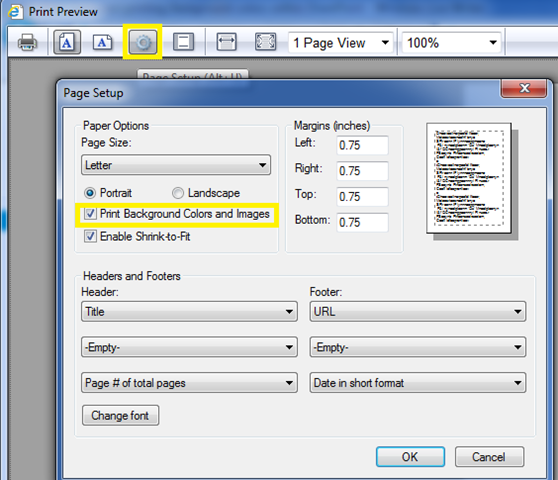 It is the Print Preview Settings. In the appearing dialog click on settings button. There you are, now you can see the Print Preview dialog itself having Color Background. 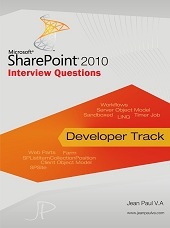 In this short article I would try to reveal the meaning of SharePoint SKU? The expansion of SKU is Stock Keeping Unit and it represents variations of the same product. Plus there are trials too. 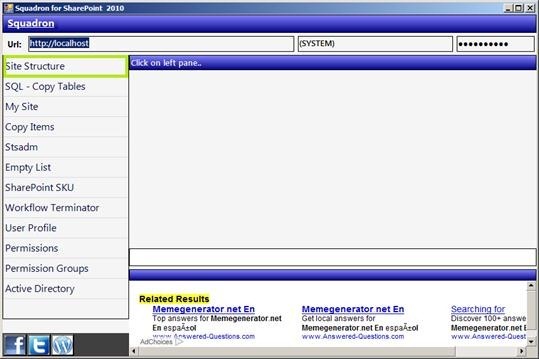 The SKU can be determined through the registry key in the installation machine. 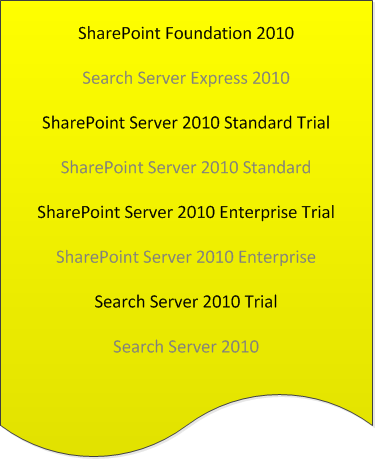 Following are different SKU variations of SharePoint 2010. When the knowledge is Important? 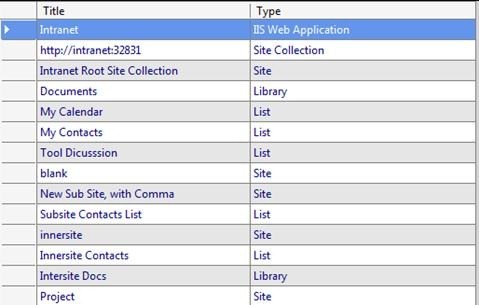 While working with customer locations, you might need to know the variation of SharePoint installed. This will allow you to understand the underlying features available. How to find the SKU? You can run the following code to find the SKU. //Open the registry key in read-only mode. //Get all of the installed product code/SKUId pairs. //Get the SKUId and see whether it is a known product. Squadron 2010 – Free SharePoint Tool has the SKU functionality integrated. You need to just click on the SharePoint SKU add-in. Squadron is a ClickOnce technology enabled application which automatically updates itself with latest functionalities. Additional to SKU there are other add-ins for analyzing site structure, permissions, list manipulations, workflow terminations etc. In this article we can explore the Performance Impact on Unique Permissions. While creating a site, list or library by default it INHERITS permissions from its parent. In this case whatever permission changed in the parent level will get carry forwarded to the new child. For example you have a COMMON site where all the employees have READ access. You are creating a new RESTRICTED library under this site, which by default all the employees can read. 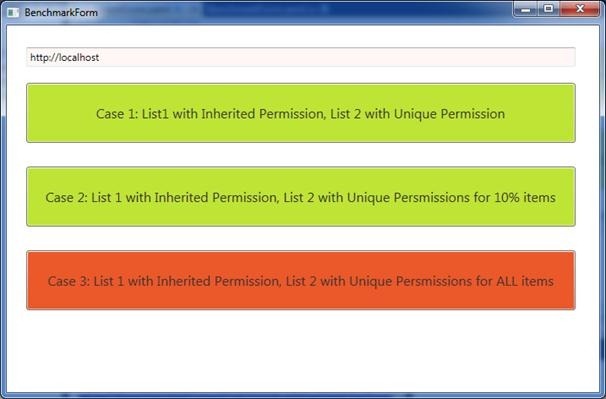 In the above case you can BREAK inherited permission at the list level & add only those users with read permission. This method is called BREAKING PERMISSION or assigning UNIQUE PERMISSION. Coming to the point, I have noticed that there are rumors spreading unique permission lead to UNDER PERFORMANCE meaning there is more time in loading the list or list items associated. Let us BENCHMARK the performance with a 1000 item scenario. I am using a small WPF application which creates the lists & list items associated. Please note that the Performance is tested only for accessing the list items. Following is the code to create Lists. Following is the code that breaks the inheritance in list level. Following is the code that breaks inheritance in item level. You can use the source code attached to examine the code & run the application. As we have tested with Breaking Inheritance in List level, Items level, All Items level and still cannot find any enormous difference in Performance for a typical 1000 items scenario. Please note that breaking inheritance in item level up to 1000 items is a rare case. Whenever Unique Permissions are implemented there are more calls to the database in fetching Permission Information. But we can see that if there are only few items involved (for example less than 100), the performance impact is negligible. In this article we have explored various case studies involving Unique Permissions. The typical benchmark scenario shows that there is no much impact in performance in just breaking permissions. 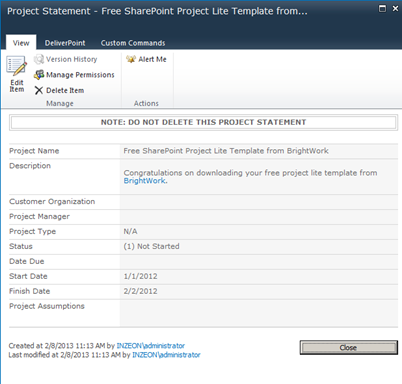 This is a continuation article of the previous one – SharePoint 2010 Free Project Template which you refer for overview & installation of Project Lite. In this article we can see the various features of Project Lite template. 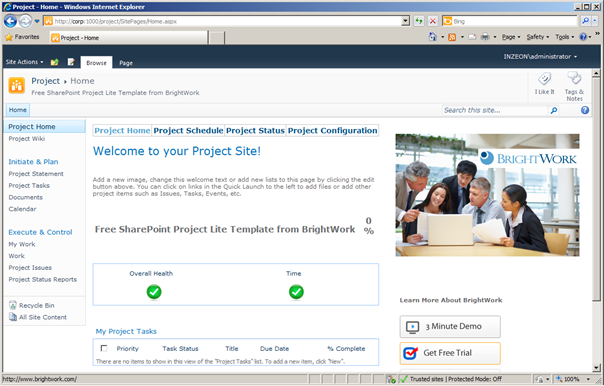 After installation, we can create new Project Site from the Site Actions > New Site dialog. The Project Statement can be set through the left side link. Using the Project Schedule link we can manage tasks in Microsoft Project application style. 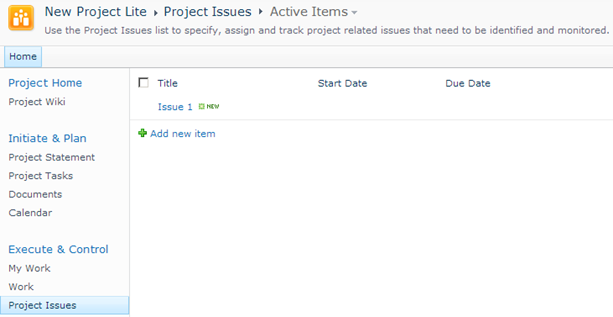 The Project Status page shows information on Tasks, Completion Percentage & Other symbols. 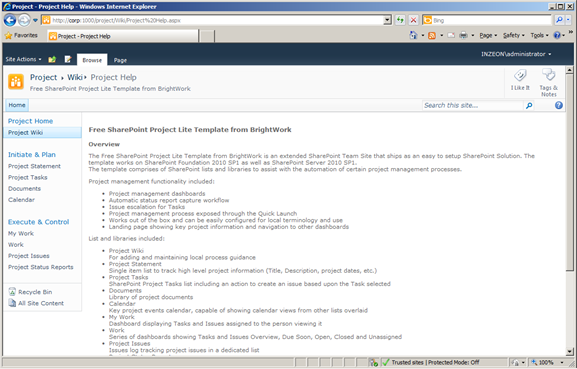 The Project Configuration link can be used to change the Project Icon, Theme etc. There is a document library for storing project related documents. From the left hand side, you can launch the Project Wiki page. Project Issues can be managed through the Project Issues link from Quick launch. So this concludes our overview on the Project Lite template. This concludes our article on exploring Project Lite site template. In real world scenarios we can use each Project managed as separate sites of same Project Lite template. The advanced template named Project Structured includes features like Scrum Support, Synchronization with MS Project application etc. 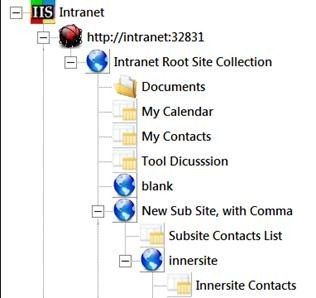 The tool seems to be working with SharePoint 2010. Squadron 2010 – Now with ClickOnce! I am happy to deploy Squadron 2010 with ClickOnce enabled. I believe this will reduce the deployment hassles as reported by community members. Click on the Install button, download the file, execute it & you will be ready within few minutes. There are shortcuts in the desktop too. I will be adding tutorials for individual modules within a week. Please bear with me & do not forget to send your feedback, I am always there to help you.